I've purchased a Samsung Galaxy S10 Plus (France). My FLAC collection is 24/48. It seems that, in the Hi-Res output settings, only 16/48 is available (for headphones/AUX output that I use (Fiio FH5)). 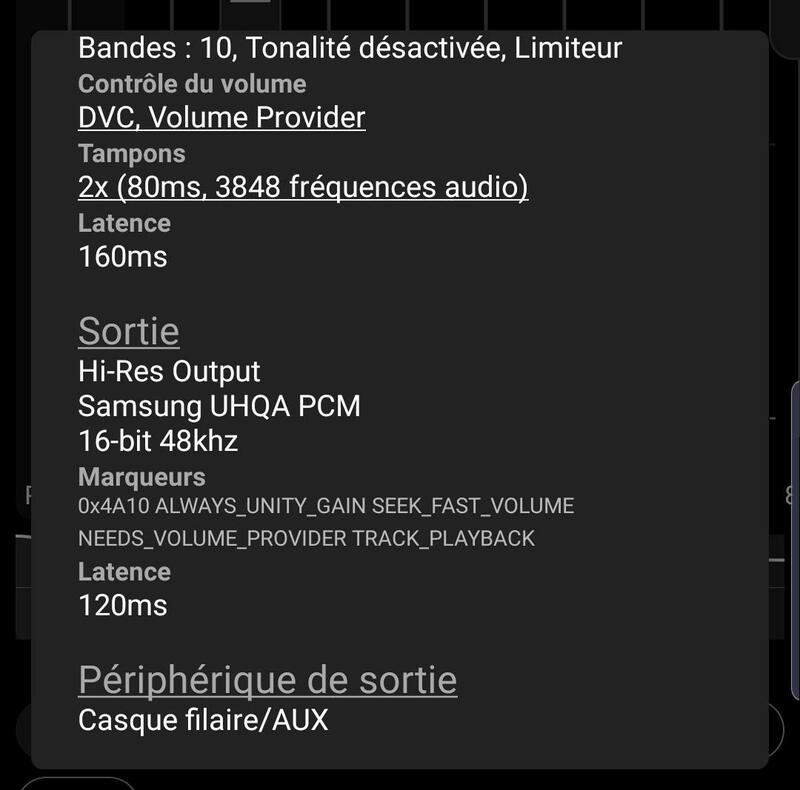 I'd like to know if, by tweaking the settings (both the Galaxy's and Poweramp's ones), there's a way to have the Hi-Res function to work for my headphone output, or if there is a fix for this. I use the EQ and limiter, it displays a "(i)" next to "DVC EQ LMT", what does this mean please ? Where do you see this ? Could you perhaps provide a screenshot ? What "DVC" means is clear ? Direct Volume Control. You might try to disable it. Should be used if possible, bypasses Samsung's sound alive, but doesn't work on each and every environment. If it's the "i" shown in the screenshot below, long pressing it will bring up the audio info. I don't know how to bypass Samsung's sound alive, gonna Google. Yes, when you long press on the info bar, the audio info will come up, see the screenshot in my previous post. You know how to access the settings ? Settings > Audio > Advanced Tweaks > Direct Volume Control will enable/disable DVC. When enabled Samsung's Sound Alive will be bypassed. Looks Good ! Does it sound good ? So you use lossless flac with 48khz sampling rate, no resampling, and 48khz hi-res output. It sounds "fine", but have a look at "Sortie" (Output) : "16-bit" => Why isn't it displayed "24-bit" as my FLAC are ? It isn't hi-res isn't it ? You do use the high-res plugin. I believe it's *ucked up for me (for us Samsung S10 users) for now, isn't it ? The problem seems to be Samsung devices + their implementation of Pie. You need to turn DVC off to get higher resolutions, but the solution is by no means perfect and there does not seem to be a workaround as yet. I suspect I'm about the have the same problems myself, as my trusty but elderly Galaxy Note 3 has finally succumbed to dementia (mmc_read failure) and gone to the Great Home for Retired Telephones in the Sky. There are no any other sample rate/sample bitdepths combinations, at least for currently available ROMs. 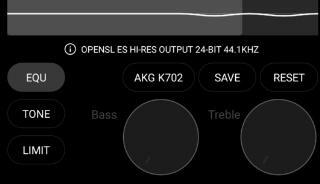 In Poweramp Hi-Res output settings you can choose sample frequency, Poweramp chooses the only available bit depth for given rate automatically. Well you are not going to find any high-res options if you don't select Hi-Res Output. 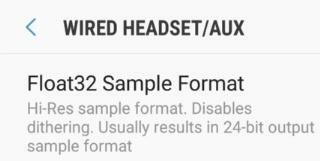 Choose high-res as the option for the Headset/Aux device and then you should be able to select 192khz/24bit (no DVC). I had the same issue with my s9 , the only version that brings the same quality (higher volume,no distorsion,good soundstage) like oreo ,whas the build 820. According to above, i should get 32 bit depth with 384khz sampling right? But it shows 24bit at 384khz, I am using Exynos S10. My platform: Phone Samsung Galaxy S10 and wired 3.5mm audio: I experienced a set-back from 24 bit to 16 bit after the last Google Play update of Poweramp (build 823). E.g., I was able to play 96k/24 with the previous build. Now, it will only give me 16-bit. However, I followed this thread and the instructions to force it to 192kHz, then 24 bit is again possible (no DVC, actually, the "No DVC" switch is not avaible at all, in the previous build, I could select DVC on/off, but only DVC-off gave me 24-bit). So, as far as I can tell, it will resample all music file resolutions to 192/24. I can live with that for time being, I now understand this is a Samsung Pie issue. Off-topic: I've also found that Dolby Atmos (in the S10) should be set to off, since it adds dynamic compression processing that I do not like. 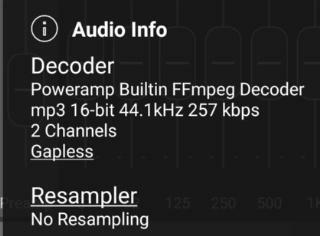 Correct, Poweramp uses s32 format for 384khz internally in this case - otherwise it won’t work - this is not visible in a UI currently, I’ll fix this for the next builds. Here's the info for my exynos s10+. Would have wanted Poweramp to have a "Follow Frequency" feature just like that in Neutron and Bit Perfect "When Possible" playback in UAPP. Won't need the resampler if Poweramp selects the appropriate sampling freq based on the audio being played.